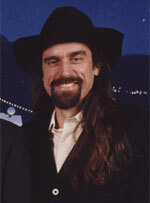 It doesn't take a rocket scientist to realize Chris Ferguson received the nickname "Jesus" because of his long hair and his beard. But it does take a rocket scientist to beat him. A winner of six World Series of Poker bracelets, the 2000 WSOP event and 2008 NBC National Heads-Ups Poker Championship. Chris has taken home more than $9 million in live tournament play. Ironically, he says he never wears his famed cowboy hat outside of the poker room. Some believe he wears the hat only to fool others into believing that he's not that great of a player. Fat chance. Chris was born in LA to parents with PhDs in mathematics, and his father teaches game theory and statistics at UCLA, so it's no wonder that he's into academia. A graduate of UCLA, Chris has a PhD in Computer Science with an Artificial Intelligence emphasis. Because of this, he usually approaches poker purely intellectually, rather than relying on his feelings or emotions. He started playing poker games with his parents as a child and eventually graduated to low-limit games at Vegas casinos, but it was not until 1993 that he started taking the game seriously. In his spare time, Chris is also a great ballroom dancer and a stock market "day trader", and he says he doesn't consider himself "obsessed" with poker at all. In September 2011, he found himself in the cross hairs of the U.S. Justice Department in a civil suite where he a three others were accused of running a Ponzi scheme that paid out $444 million to themselves and other high level executives at Full Tilt Poker. In 2013 the case was dismissed. Chris was a long-time member of Team Full Tilt as one of their sponsored pros. Chris can throw playing cards so fast that they will cut through carrots. Don't tick him off at the table! Chris is also a research assistant and hopes to be a professor himself one day...a professor of game theory just like his dad. He ran the UCLA ballroom dance club for three years, and still enters dance competitions. On an interview he claimed to have turned $1 into $20,000 over six months of online play.